One week from now the final book in the Divergent series, entitled Allegiant, will find its way into your favorite bookstores. Veronica Roth might be in cloud 9 right now after successfully completing her well-received trilogy. What's more... the movie adaptation of Divergent is on its way to the big screen. In an interview she did with Harper Teen, Veronica Roth discusses "Tris’s choices leading to Allegiant, Caleb’s surprising actions in Insurgent, and visiting the Divergent movie set!" Aren't you excited to read the finale to the Divergent series before finally watching the movie? 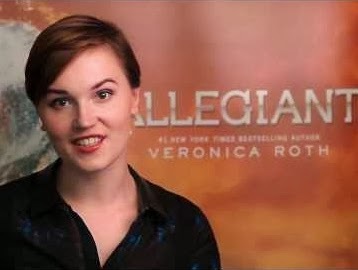 Here is author Veronica Roth talking about Allegiant. Allegiant by the #1 New York Times bestselling author Veronica Roth will hit book stores on October 22, 2013.